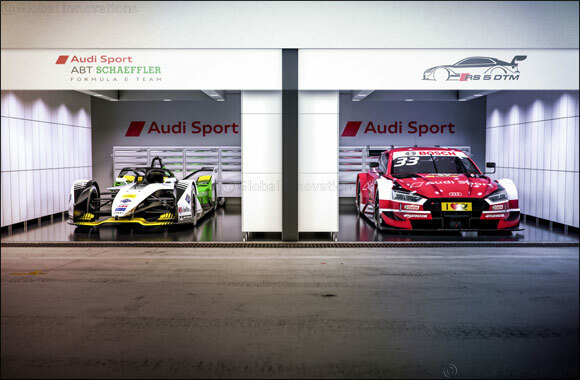 Dubai, UAE, September 09, 2018: In 2019, Audi will continue to compete with electric power in motorsport. At the same time, the manufacturer will prolong its factory-backed commitment in the popular DTM touring car series. In the 2017/2018 season, Audi was the first German automobile manufacturer on the Formula E grid. Having scored four victories and a total of eleven podiums after twelve races around the globe, Audi Sport ABT Schaeffler claimed the teams’ championship. The commitment in the fully electric racing series that is currently experiencing a boom with the participation of other manufacturers and partners forms the electric pillar of the brand’s motorsport involvement. Furthermore, Audi will continue to be active in the DTM and gripping motorsport with internal combustion engines in the future. Next year, the DTM will see one of the most radical changes in its more than 30-year-history: In 2019, modern four-cylinder turbo engines will be introduced. In addition, the so-called “Class One” being driven by the DTM and the Japanese Super GT will make its debut. The new regulations will make it possible to field the cars in both championships. It provides the basis for the joint races to be held for the first time starting in 2019 and increased internationalization. Following Mercedes-Benz’ exit, a minimum of three brands being represented from 2020 on at the latest will be the prerequisite for Audi’s continuing DTM commitment.